Welcome back to Viv’s Great American Food Adventure, and today I am cooking up some flavourful smokey bacon corn chowder. I have heard only good things about this soup so I could not wait to get started. I used to buy tins of thick chowder-type soups from the store … you know, those Campbell’s ones. I especially enjoyed their creamy potato & bacon chowder, so upon embarking on making this soup for the very first time, I strove to mimic the flavour and consistency of the only reference I had of a chowder. 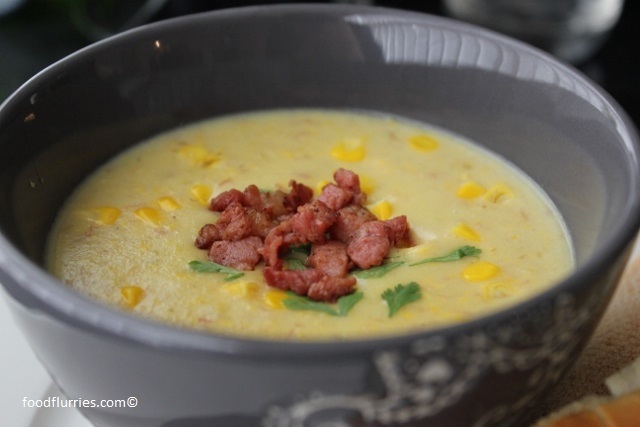 Never made corn chowder before but, how hard can it be, eh? After a week of reading I have a better appreciation for the grain and much more respect, inspite of its humble profile. When the first English settlers landed in the Northeast of the American continent they brought along with them supplies and food from their homeland. When these proved to be insufficient, they almost starved to death because they were not accustomed to farming coz they were business people … merchants. Also, they were reluctant to try the “alien” foods of the land even though the place was teeming with maize, fruits, berries, wild mushrooms and seafood.¹ Eventually, they relented and accepted food offered to them by the Algonquian Indians, and some even learned the methods of growing their own crop. The Indians introduced corn, baked beans, squash and wild turkey to their diet ³… and there they stayed to this day, over three hundred years later. 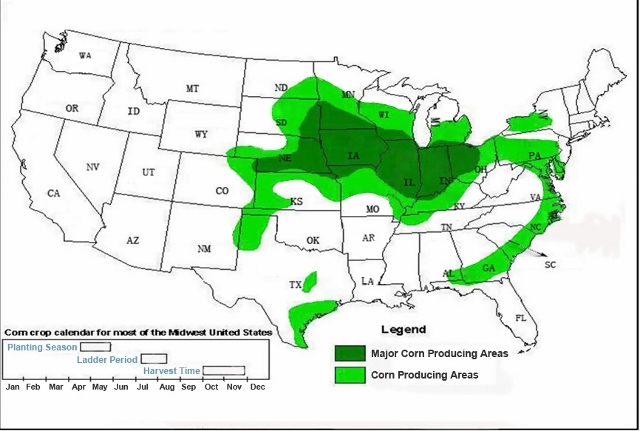 Since then, the cultivation of corn has expanded and much of the Midwest states have come to be carpeted with corn fields. As for the beans … here I was, thinking baked beans were an English thing. I’ve since discovered that baked beans only arrived in England during the 1920’s when the Heinz Company (totally American) first began exporting their soups and bean products across the pond.² Anyway, our main interest in today’s cooking experiment is once again the humble corn kernel. In my last post I made Johnnycakes and they came out pretty well. 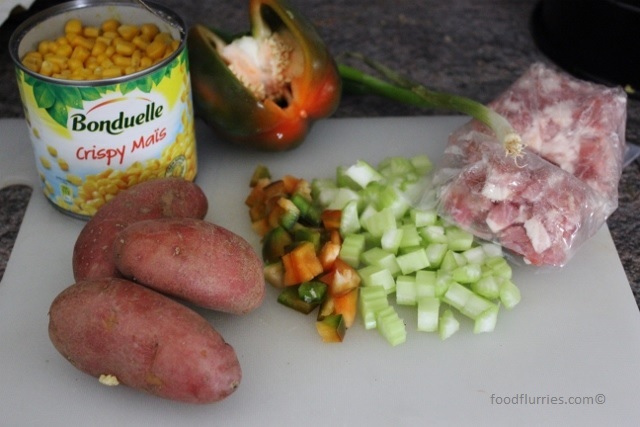 Today I am making smokey bacon corn chowder …. heavy on the bacon. Did a lot of reading (again) to find out what is and what isn’t acceptable when making a corn chowder. It would seem that so long as you have corn and potatoes in there, anything goes. Some have chicken, some have crab, in there. Chunky or smooth, the choice is up to you. Personally I like to puree my soup which enables me to skip making a roux. Bacon gets sauteed gently in a bit of oil, to render. Once they are nice and crispy and golden, add the onions and garlic. Sautee until soft but not coloured … to achieve this you want to cook them on very low heat. It may take a while but you really want to try not to caramelize the onions too much. Add the celery and peppers. Again, sautee gently without any color. Add water or stock. I used half chicken and half vegetable stock. Stir and add the sprig of thyme. Add the potatoes and half the corn. Bring up to a boil then simmer gently until the potatoes are tender … about 20 mins. Use an immersion blender or transfer the soup to a food processor, blitz to a puree and return the soup to the stove. I like my soup thick and creamy, and doing it this way enables me to skip the addition of roux. Much less calories went into this soup pot. Now taste the soup and adjust seasonings accordingly. If my measurements are right, it will only require some freshly ground black pepper. There is enough saltiness coming from the bacon. Pour in the cream and the other half of the whole corn kernels. Simmer for another 2 – 3 minutes. Garnish with freshly chopped parsley and serve with croutons. If you ask me, this soup would taste perfect the next day, after all the flavours has had a chance to mingle and develop … but if you cannot wait then I suppose there isn’t any harm in tucking into the soup immediately. Perfect for cold rainy nights coz the starch in here really fills you up and keeps you warm. As usual, the boyfriend turned his nose up to the soup. Don’t know what his problem was, but for dinner he asked me for pasta and sausages when we already had this lovely big pot of soup! I give up. I forsee that I will soon be cooking for just myself and I’ll tell him to feed himself with whatever he sees fit. Lol. I really annoys me when I cook perfectly good, wholesome food only to have them turned down for no specific reason. 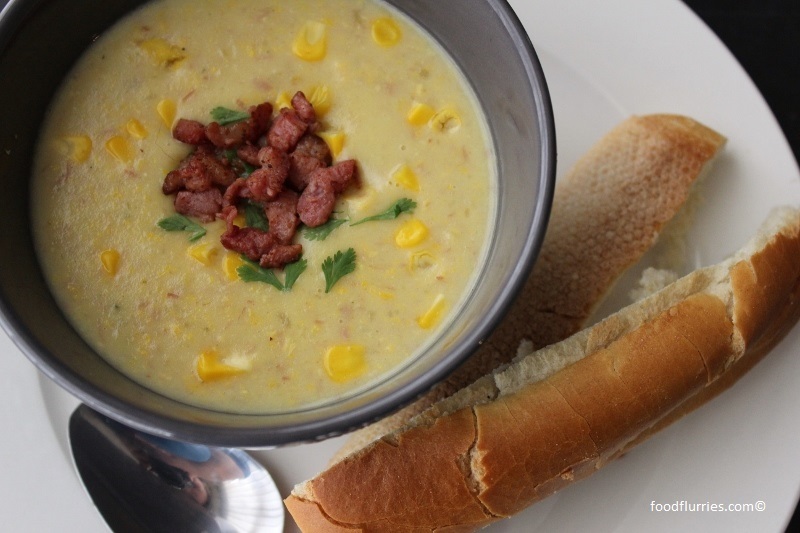 What’s not to like about corn chowder? Anyway, you will like this soup and I hope you try it out. I, for one, am quite thrilled to have learned a new recipe. So far so good … two new American recipes and they are all wholesome and healthy. This has only served to increase my optimism and excitement as I work my way down the list I had made. Two recipes down … only another twenty-four to go. Join me next time as I tackle the classic bowl of Chilli, as well as pastry making (GULP!!) with homemade empanadas. This will be good!